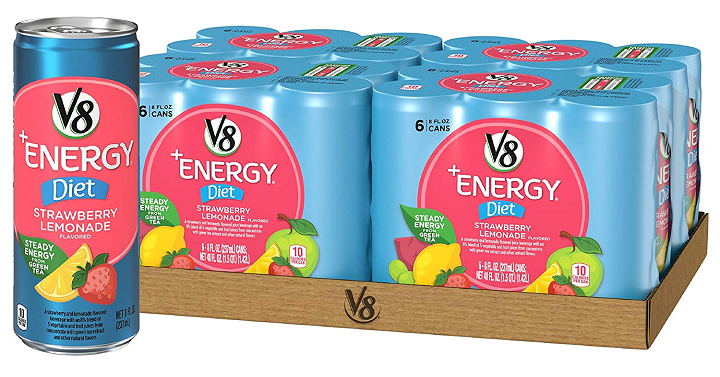 V8 +Energy, Diet Strawberry Lemonade, 8 Ounce (Pack of 24) Only $10.59 Shipped! That’s Only $0.44 Each! Need some energy to make it through the day? Right now Amazon has their V8 +Energy, Diet Strawberry Lemonade, 8 Ounce (Pack of 24) Only $10.59 shipped! That’s Only $0.44 Each! This has the same level of caffeine as the leading energy drink with only half the sugar. Keep in mind, Amazon pricing can change at any time! Don’t wait to purchase this deal or it might be gone when you come back! NOTE: With Amazon Subscribe & Save, you save an additional 5% off the price and get free standard shipping. You are free to cancel at any time. After placing your order, wait until your order ships. Then, you can go into your Amazon Account page and click the “Manage Subscribe and Save” link and cancel it. That way you won’t have continual shipments of your order in the future. PLUS, remember, if you have 5 or more Subscribe & Save items that arrive in the same month, you will save an additional 15% (instead of 5%).